Bill Hayes, Oliver Sacks’s partner in the last six years of Sacks’s life, is posting photographs of Sacks’s marginalia. J.W. Dunne, An Experiment with Time, 3rd. ed. (London: Faber and Faber, 1958). J.W. Dunne’s An Experiment with Time, first published in 1927 and widely read in its day, advances a theory of dreaming as a form of precognition. In a post about Insomniac Dreams, the recently published book that collects Vladimir Nabokov’s experiments with Dunne’s theory, I mentioned in passing that Dunne seems to be a figure straight from the Museum of Jurassic Technology. 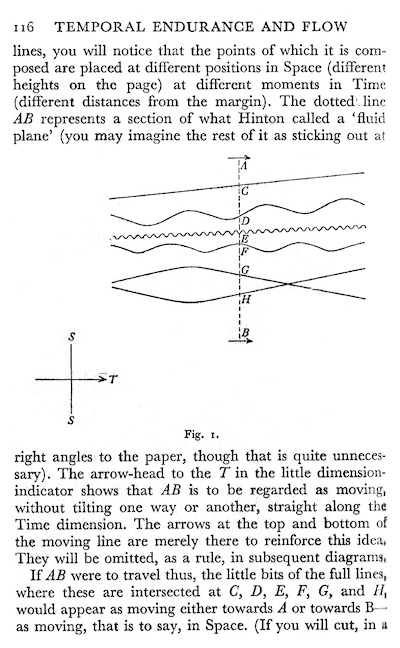 I have now turned the pages of An Experiment with Time (thank you, interlibrary loan) and am excited to see a number of baffling diagrams. This one is my favorite. And now I strongly suspect that Dunne’s work helped to inspire the MJT’s Geoffrey Sonnabend and his theory of obliscence. Consider this diagram, which appears on an MJT T-shirt, or this one, which appears on the cover of a pamphlet summarizing Sonnabend’s work. I’m a longtime fan of the Museum of Jurassic Technology, and yes, I have both the T-shirt and the pamphlet. Lawrence Weschler’s Mr. Wilson’s Cabinet of Wonder (1995) is an excellent introduction to the museum and its work. I visited in 2012 and was lucky to meet David Wilson, who happened to walk by as we stood in the rooftop garden. Right place, right time. Yes. I remember the joking self-characterization of my school days: “I am a lowly graduate student.” That should never have been a joke. 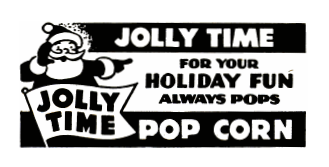 Oh — popcorn machines first appeared in movie theaters in 1938. My mom and I were wondering about that recently. W.G. 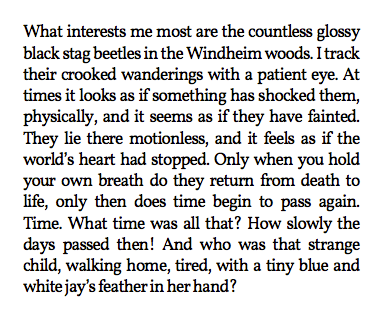 Sebald, The Rings of Saturn, trans. Michael Hulse (New York: New Directions, 1998). The failure of the “eccentric undertaking” described by Sebald was so great that it left little of lasting legacy. It is tempting to conclude that the author’s odd choice of names for his scientists — Herrington and Lightbown — is a quirky invention, one of his own “red herrings,” sending the reader off on every bit as much a wrong scent as the fox in that ancient practice, when that strong-smelling fish was employed to trick the hounds from following in their quarry’s tracks. 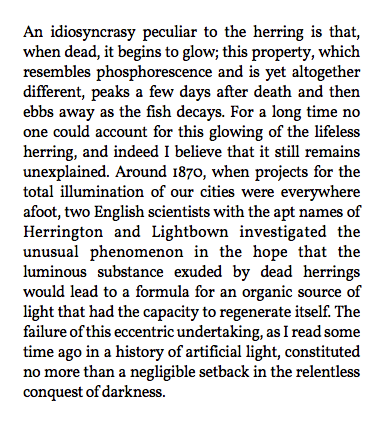 For all that the practice of generating light from herring occurred in the late nineteenth century, there does not appear to be a record of the existence of any two English scientists with their names. Deb, a Granada House resident who stayed on, appears in Infinite Jest as Pat Montesian. Deb’s story of recovery appears at the Granada House website. As does Wallace’s, identified only as an ex-resident’s story. Why have I written Deb and not Larson-Venable? Because I met Deb Larson-Venable in 2010, on a trip to Boston, when Elaine and I went to Granada House to make a contribution. This fellow shows up in one scene in La roue (The Wheel) (dir. 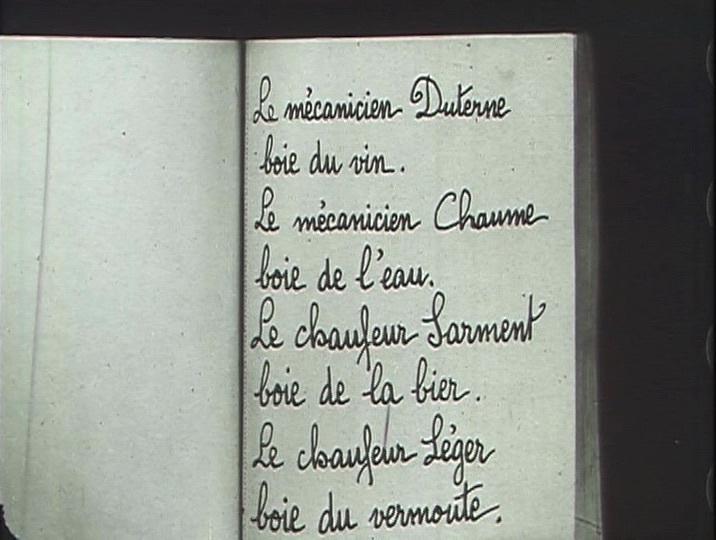 Abel Gance, 1923). His newspaper is just a cover. 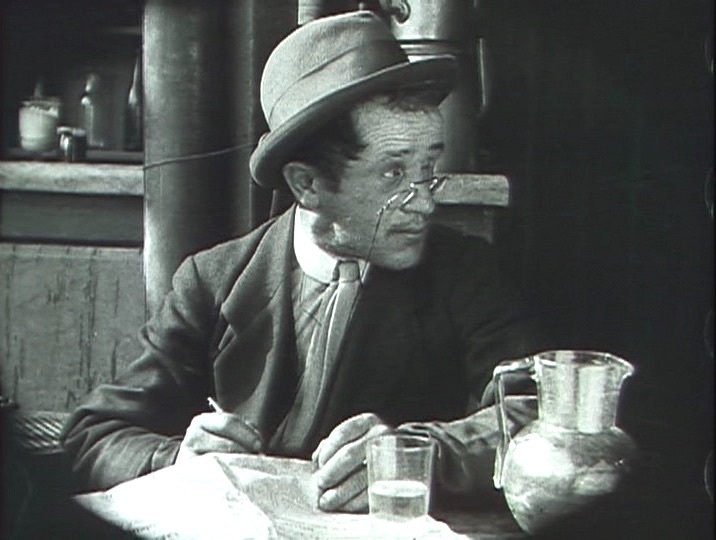 His real work: recording the drinking habits of the trainmen. We are three-hundred-and-twenty-five million opinionated, vociferous individuals. We argue and compete and sometimes even vilify each other in our raucous public debates. But we have always had so much more in common with each other than in disagreement. If only we remember that and give each other the benefit of the presumption that we all love our country we will get through these challenging times. We will come through them stronger than before. The letter echoes McCain’s 2017 speech at National Constitution Center. I hear too what I think is an echo of what Barack Obama said in 2011: “The forces that divide us are not as strong as those that unite us.” I hope that Obama and McCain are right. Kid Glove Killer (1942). Van Heflin and Marsha Hunt as police forensic investigators, solving crimes in a city rife with corruption. Also included: a love triangle, a radio show and its host, a wrongly accused diner owner, fun with microscopes and spectroscopes, and many moments of bumming and lighting cigarettes. In other words, this movie is a little too scattered. But Heflin and Hunt are a delight as they turn cigarette ignition into foreplay. I will now consider my habit of walking (about three-and-a-half miles a day, virtually every day) a vanquishing of the past. John Dickerson: “School is starting again and I am sharpening my pencils. That’s not a metaphor. I am actually sharpening pencils.” Read more to find out why. Today’s Newsday Saturday Stumper, by Lester Ruff, is pretty easy. Pretty, pretty easy. It starts with a giveaway, 1-Across, thirteen letters: “Musical set at the Sleep-Tite factory.” I know that one thanks to Elaine and Rachel. A later giveaway, 64-Across, 15 letters: “Bavarian cream desserts.” I know that one from its Brooklyn, not Bavarian, incarnation. I’ve never thought of its plural, which sounds kinda ridic. The plural, that is, not my never having thought of it. One clue that I especially liked for its mild misdirection: 51-Down, six letters: “Apollo headgear.” HELMET? No. And no spoilers: the answers are in the comments. This cover-to-come takes its inspiration from The Sopranos. The Washington Post explains. That exchange of notes was, I maintain, business-like; my note admittedly a shade less courteous than his. At the time, he was at the head, as he still is, of a very large business. The enclosed statement will show that this debt was incurred almost three years ago. If it is not paid immediately, we shall be forced to take action. I regret exceedingly that this oversight should have occurred. Herewith please find enclosed my cheque for the amount involved. Your favour of the —th received. Please find our receipt enclosed herewith. Now that the matter has been satisfactorily settled, we should be glad to do business with you again. A fitting reply to that letter would be —. But no, perhaps not. Eric Partridge, A Charm of Words (New York: Macmillan, 1960). The problem, for those who want to ditch guys, is that their language doesn’t present them with many versatile replacements; English lacks a standard gender-neutral second-person plural pronoun, like the Spanish ustedes or the German ihr. The alternatives to guys tend to have downsides of their own. Folks — inclusive and warm, but a little affected and forced. Friends — fine in social contexts, strange at work. People — too often pushy and impersonal. Team — its sense of camaraderie wears out with constant use. One might cobble together a mix of pronouns to deploy in different scenarios, but no one term can do it all. As for a standard gender-neutral second-person plural pronoun, there certainly was one when I was a kid in Brooklyn: youse. Strange days might require that ordinary idioms go out the window, so to speak. But I think it’s more reasonable (though not safer) to say that the wheels are starting to come off. Mystery actors I don’t think anyone’s going to solve this one. I put the answers in a comment. Do you recognize one? The other? Both? Leave your best guesses in a comment. 12:25 p.m.: I think everyone has given up. The answers are now in the comments.
? : ? : ? : ? : ? : ? : ? : ? : ? : ? : ? : ? : ? : ? : ? : ? : ? : ? : ? : ? : ? : ? : ? : ? : ? : ? 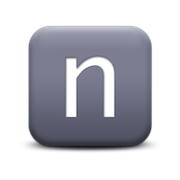 NameChanger is a free app for macOS and OS X that makes renaming files easier. Go from, say, IMG_3501.JPG, IMG_3502.JPG, and so on to a more meaningful sequence. NameChanger is powerful but not especially intuitive. The app’s Help page explains the many options for renaming. 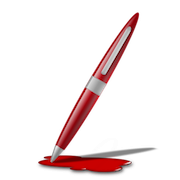 I dislike pen or pencil icons, so I used the free app LiteIcon to turn a free n into an icon. August 26: As shallnot points out in a comment, batch renaming is available in the Finder. Who knew? Not me. Here’s a brief tutorial. Thanks, shallnot. 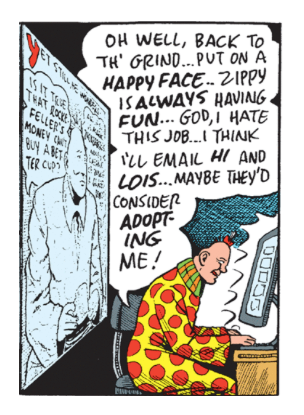 Today’s Zippy takes the reader behind the scenes at Zippy Industries, where Lazlo Crannich, the actor who plays Zippy (and writes and draws the strip), ponders his lot in life. He regrets his cranial surgery, which has left him typecast. 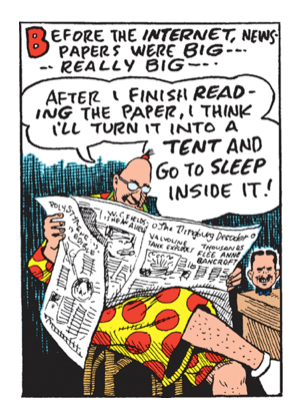 Behind Crannich, “today’s” strip (marked “8-22”) plays out on a monitor, panel by panel, with Zippy drinking coffee and thinking. It appears that Zippy might be drinking Chock full o’Nuts. Because he wonders: “Is it true that Rockefeller’s money can’t buy a better cup?” Yes, that song. Nabisco’s animal crackers are now cage-free. Or, really, a lottery by notecard, or, really, by index card, 3 × 5: “A tiny, in-demand restaurant in Maine asked for reservations by notecard — and got 20,000 of them” (The Washington Post). The restaurant, the Lost Kitchen, does look fairly magical. The word should seldom replace or be combined with a preposition. The government agencies involved in carrying out should be The government agencies carrying out. The policies involving several departments should be The policies of several departments. If a verb or participle must stand, try to find a more precise word, such as mean, affect, or include. Ross-Larson offers no further explanation. I began to wonder what’s wrong with involve and whether a recommendation to avoid it could be found elsewhere. The meaning of this popular word has been diluted to a point of extreme insipidity. Originally it meant wrap up in something, enfold. Then it acquired the figurative meaning entangle a person in difficulties or embarrassment, and especially implicate in crime. Then it began to lose colour, and to be used as though it meant nothing more than include, contain or imply. It has thus developed a vagueness that makes it the delight of those who dislike the effort of searching for the right word. It is consequently much used, generally where some more specific word would be better and sometimes where it is merely superfluous. I have no idea what airing an old PBS show might involve in the way of permissions. I have no idea what airing an old PBS show might require in the way of permissions. My most vivid Dance Festival memories (P.S. 131, Boro Park, Brooklyn) involve crepe-paper sashes and armbands and a song called "Wind the Bobbin." My most vivid Dance Festival memories (P.S. 131, Boro Park, Brooklyn): crepe-paper sashes and armbands and a song called "Wind the Bobbin." Rachel was involved in a group project on Millay and has now read enough of her work to last a lifetime, thank you. Rachel worked on a group project about Millay and has now read enough of her work to last a lifetime, thank you. Is it worth taking the time to make these minor adjustments to old posts? Is anyone likely to notice the difference? Yes: me. I’m not Catholic, not even a believer. But if were Catholic, here’s what I do: I’d put two cents in the collection plate. Doing so might be a way to send a message that things must change. Change: I didn’t even think of the pun until I typed it. If enough people put their two cents in, the church would also have to figure out what to do with all those pennies. Bringing them to a bank would be unseemly. Coinstar? Please pass this suggestion on to anyone who might want to consider it. A pocket notebook is handy when it’s not safe to speak. 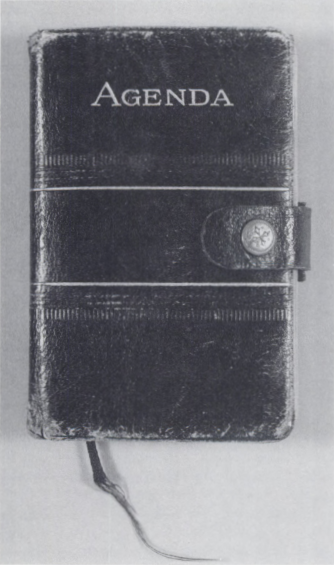 This notebook plays a small, vital role in Eyes in the Night (dir. Fred Zinnemann, 1942). 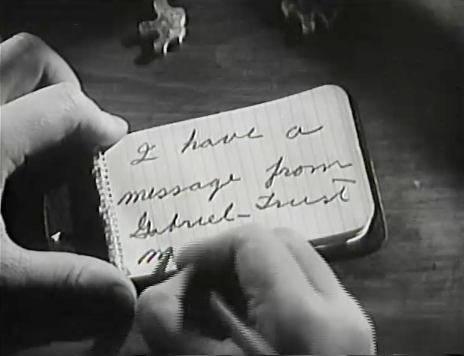 Duncan “Mac” Maclain (Edward Arnold), a detective, writes these messages while someone listens on the other side of the door. How does Mac know someone’s there? His faithful dog Friday has given him a telling nudge. Mac is blind. And yes, he does jigsaw puzzles. A pocket notebook is also handy when writing a message for Friday to deliver. And gosh, does Friday deliver. He out-Lassies Lassie. Sorry, girl. 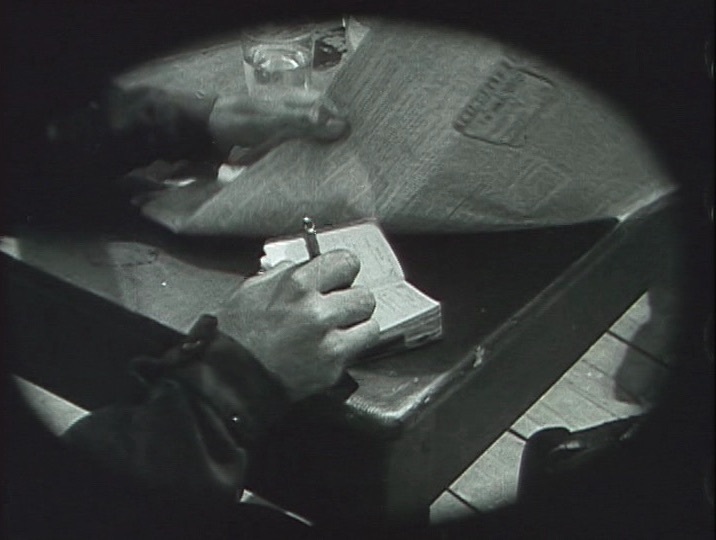 Eyes in the Night is a thoroughly satisfying movie, available at the Internet Archive. The Avital Ronell story Now with a lawsuit, a press release, more reportage, and a comment on the term educator. Today’s Newsday Saturday Stumper, by Greg Johnson, is difficult. For me, forty-eight minutes of difficulty. Getting the answer, finally, to the ultra-vague 1-Down, “Development facilitator,” let everything else begin to fall into place. Two clues that I especially liked: 49-Across, ten letters: “Flat-bottomed vessels.” And 58-Down, three letters: “The tennis US Open is played on it.” Talk about your misdirection! No spoilers: the answers are in the comments. “What is happening to us? What are they doing to us? We’re being kicked around by crazy people”: Martha Dobie (Miriam Hopkins) in These Three (dir. William Wyler, 1936). The conversation at the diner has turned to graphic novels. “You like graphic novels, Louise?” “I never read one, Mr. Nesbitt.” Above, Mr. Nesbitt’s reply. 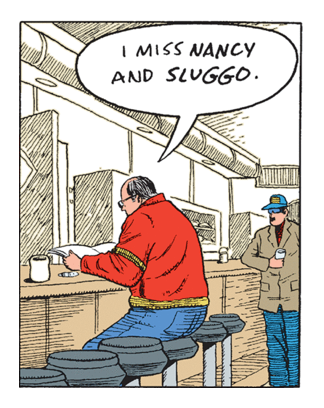 Mr. Nesbitt needs to know that unlike the snows of yesteryear, Nancy and Sluggo will be with us always. On a daily basis, in original and more recent incarnations. 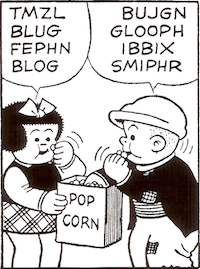 And in great big books, though Nancy Loves Sluggo: Complete Dailies 1949-1951 appears to be out of stock at the publisher. Previously: newspeak, doublethink, Big Brother, unperson. In her indelible late-1960s hits, Ms. Franklin brought the righteous fervor of gospel music to secular songs that were about much more than romance. Hits like “Do Right Woman — Do Right Man,” “Think,” “(You Make Me Feel Like) A Natural Woman” and “Chain of Fools” defined a modern female archetype: sensual and strong, long-suffering but ultimately indomitable, loving but not to be taken for granted. Did you see her Kennedy Center Honors performance? When I retired from teaching in 2015, The Crow suggested pouring some single malt Scotch. I bought a bottle of Glenlivet. A few weeks ago, when Elaine went looking for a (third, I think) bottle, the store was out. 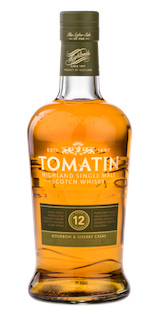 A clerk recommended Tomatin. I don’t think it’s much like Glenlivet at all. But I like it. I like it. I like it. I’ll let the distillery speak: “A rich, fruity aroma is the prelude to sweet flavours of ripe apples, pears and a subtle hint of nut before the long, pleasantly oily finish.” Can an oily finish be pleasant? Here, have a sip. Thanks, Martha, for the single-malt suggestion, which I took to heart. Previously: newspeak, doublethink, Big Brother. “Suddenly it’s too late”: a line from “Time Song,” a previously unreleased Kinks song, no doubt written by Ray Davies. Backstory here. As a kid, I had time for just one great group. But as I wrote in a 2016 post, “I’m now convinced that there were three great pop groups in the 1960s: the Beatles, the Beach Boys, and the Kinks.” I wish that I knew what I know now when I was younger. Ray, Dave, Mick, it’s not too late to get the band back together. Then again, it is, really. A reunion would be a sad shadow of its original. This week at A.Word.A.Day, words from George Orwell’s Nineteen Eighty-Four that have entered the English language. Today’s entry: Big Brother. Under His Eye. Small town, car, screen More to this story of small-town life. This week at A.Word.A.Day, words from George Orwell’s Nineteen Eighty-Four that have entered the English language. 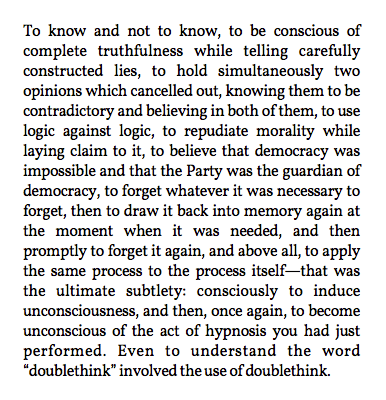 Today’s word: doublethink. Yesterday’s: newspeak. One sign of the reality-TV-ification of everything these days is the reduction of persons in political life to first names: Chuck and Nancy, Jared and Ivanka. I think all the way back to the first season of Big Brother: George, Eddie, Jordan. (Those names, I am surprised to discover, have stuck in my head.) “Omarosa,” too, is a character from the world of reality-TV. The woman who worked in the White House is Omarosa Manigault Newman. Newscasters should refer to her by her name: Manigault Newman, or Ms. Manigault Newman. But the less time cable news spends on Manigault Newman, the better. She offers a form of reality-TV spectacle that distracts from urgent issues of the real: tariffs, Helsinki, North Korea, Russian hacking, emoluments, conspiracy and obstruction, Congressional inaction, the firing of Peter Strzok, refugee children separated from their parents, and the incurious, ill-informed, misogynist, racist president at the heart of it all. “Trump at war with Omarosa!” said someone on MSNBC this afternoon. No, that’s entertainment posing as news — which leaves less time for news. A pause. “Groceries,” he said, and walked off. He must have thought we were asking where to find canned food. He must have thought we were idiots. An older store clerk saw us looking puzzled and asked if he could help us. He directed us to the canning section, a couple of aisles away. I told him what I had told Elaine. “I grew up on a farm,” he explained. I told him that we were putting up peaches and pickles. “There’s nothing better,” I said. He agreed. But there are no farms in our past. We have come to canning on our own. Or on Elaine’s own. I’m a designated helper. An excellent podcast: Word of Mouth (BBC Radio 4). It’s the best podcast on language I’ve heard — smart, witty, respectful of its listener’s intelligence and time. A new series starts in September. 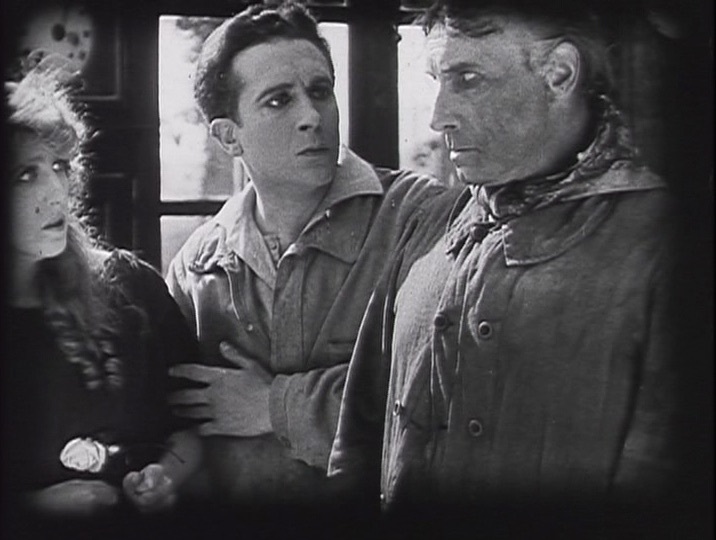 “This hectic modern life” Abel Gance’s La roue is at YouTube. Today’s Newsday Saturday Stumper, by Frank Longo, is difficult. A solver who knows something about earthworms, Kentucky history, and defunct television networks may have an advantage, though crosses can make up for the missing knowledge. A clue I especially liked, in the most difficult (for me) section of the puzzle : 17-Across, five letters: “Big name in little cubes.” RUBIK? No. But so simple once you see it. No spoilers: the answer is in the comments. “While identity affects your experiences, there’s no guarantee that what you’ve learned from them is going to be the same as what other people of the same identity have learned.” As a person wary of reducing individual identities to group labels, I think that Kwame Anthony Appiah’s essay “Go Ahead, Speak for Yourself” is worth your time. The Wheel is about four and a half hours long. We have about two hours to go. It’s an amazing film. Neither Filmstruck nor Netflix can help, but a library might have it. 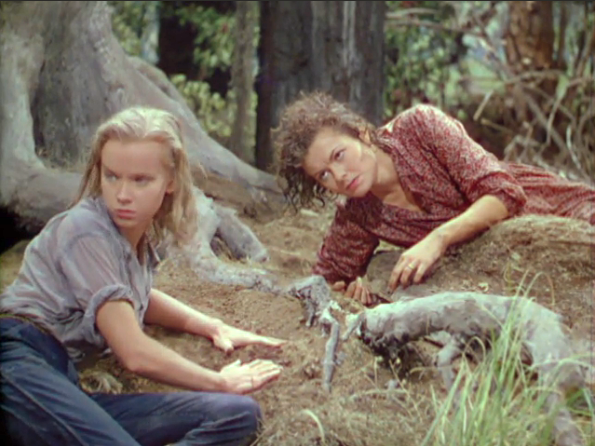 August 11: Elaine found the film on YouTube, truly silent, without a musical score: part 1, part 2. “The exhibitions focus on the production of Norwegian sardines from their first appearance in 1879 until the mid-1950s.” Say hello, or hallo, to the Norsk Hermetikkmuseum, the Norwegian Canning Museum. With a café, a gift shop, a recreated cannery, and 40,000 sardine labels. “John Ashbery’s last poem, handwritten at his home in Hudson, New York, on August 25, 2017. Ashbery died on September 3”: “Climate Correction” (Harper’s). W.G. Sebald, The Emigrants, trans. Michael Hulse (New York: New Directions, 1996). 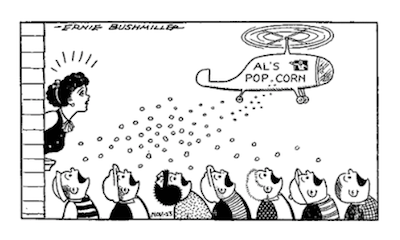 Smithsonian digs the new Nancy. Really, if I had never read a word of Sebald, seeing this full-page photograph (page 127) would make me decide to read his work. One way to know you’re living in a small town: you recognize your neighbor’s little sports car in a TV commercial for a local auto shop. August 14: Our neighbor knows about the commercial. But the car isn’t his. Someone else in town has the same little sports car, and my neighbor knows who. Further proof that I’m living in a small town. “Built about 150 years after the Battle of the Teutoburg Forest, its walls recently reemerged after centuries of darkness during the construction of a new community center next to the city of Cologne’s famous cathedral”: “Long-lost Roman library reemerges in Germany after 2,000 years in darkness” (The Washington Post). One major difference between Webster’s Second and Third is the disappearance of encyclopedic or nonlexical content: proper names (people, places, things, events, organizations), epithets, proverbs, titles of literary works, in short, the material that made W2 an all-purpose home reference. As Herbert C. Morton points out, Philip Gove, W3’s editor, was not charting a new direction in lexicography in removing the nonlexical: he was following in a tradition established by Johnson’s Dictionary and the Oxford English Dictionary. 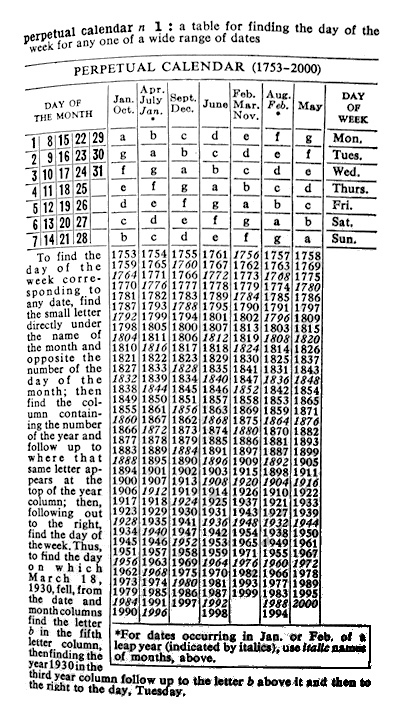 I wonder what debate the W2 entry for perpetual calendar might have sparked in the W3 editorial conferences. Clearly, the calendar itself is a nonlexical item. But as the preface to W3 says about cutting nonlexical material, “Selection is guided by usefulness.” Without a perpetual calendar, how might the layperson answer a what-day-of-the-week question? I like to imagine a Merriam-Webster editor shuddering at the thought of a dictionary user having to head out to a newsstand or supermarket in search of an almanac. For whatever reason, the calendar stayed for W3. But the differences between the W2 and W3 entries are revealing. W3 makes no mention of the Gregorian and Julian calendars and omits the fairly tedious presentation of calendar mathematics. Will a W3 reader wonder why the calendar begins with 1753? Apparently not: all 1961 wants to know is how to find out what-day-of-the-week. Of course. Calculate-the-date websites and calendar apps have made a printed perpetual calendar obsolete. The Calendar app on my Mac is reported to run well past the year 200,000. I’ve had it only once before, at a potluck, where I wondered, “Are those Tater Tots on top?” Yes, they were. Huh. Elaine made hotdish tonight, chicken pot hotdish, following a recipe from Molly Yeh, daughter of Elaine’s Juilliard pal John Bruce Yeh, and host of the Food Network’s Girl Meets Farm. OMG: hotdish is so good. Good enough to make me forget about al pastor and panang curry, at least for a while. A culinary world has opened to us. Here, from 2013, is a short, highly informative film by Maria Bartholdi: Minnesota Hotdish: A Love Story. Over the weekend, my daughter Rachel read a piece of journalism that she deemed poorly written. She texted me a link. I read and concurred. I copied and pasted a terrible sentence to send back, but then thought, “It’s not bad enough.” Then another, but again I thought, “It’s not bad enough.” And then I hit the right sentence. I copied and pasted and wrote, “Especially this sentence.” And Rachel replied that it was when she hit that sentence that she decided to send the link. My dad, James Leddy, died three years ago today, a day that feels both recent and distant. Yesterday, while Elaine and I were watching Three Identical Strangers, I thought about how fortunate I am to have had the father I had. And have. He’s an example, always, of how to be a father. Here’s what I wrote after he died. August 5, 1974, was the day the Nixon Presidency ended. On that day, Nixon heeded a Supreme Court ruling and released the so-called smoking-gun tape, a recording of a meeting, held two years earlier, with his chief of staff, H. R. Haldeman. Many of Nixon’s most damaging statements came in the form of short, monosyllabic answers and near-grunts — “um huh,” the official transcript reads, at one point — as he responds to Haldeman’s idea of asking the C.I.A. to tell the F.B.I. to “stay the hell out of” the Watergate investigation. . . .
On August 5, 2018, precisely forty-four years after the collapse of the Nixon Presidency, another President, Donald Trump, made his own public admission. 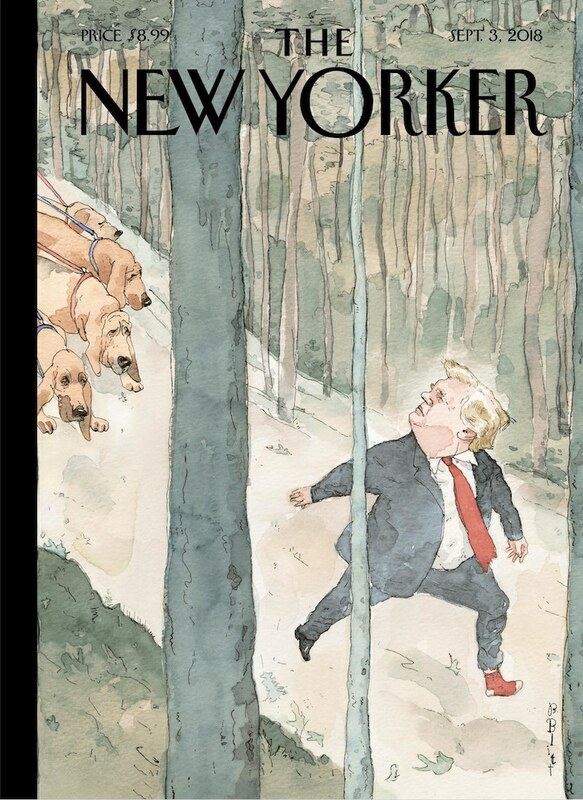 Read it all: “The Day Trump Told Us There Was Attempted Collusion with Russia” (The New Yorker). Three Identical Strangers (dir. Tim Wardle, 2018). Don’t read a word about it. Just go see it. You won’t regret it. And if you’ve already read about it, go see it anyway. You won’t regret it. From the totalitarian point of view history is something to be created rather than learned. A totalitarian state is in effect a theocracy, and its ruling caste, in order to keep its position, has to be thought of as infallible. But since, in practice, no one is infallible, it is frequently necessary to rearrange past events in order to show that this or that mistake was not made, or that this or that imaginary triumph actually happened. As I just discovered, I posted this passage in 2008. But it’s worth reposting. I don’t see any reason why it wouldn’t be. Now more than ever, as the saying went. I reencountered this passage in a new sampler, Orwell on Truth, ed. David Milner (New York: Houghton Mifflin Harcourt, 2018). Today’s Newsday Saturday Stumper, by Matthew Sewell, is tough, mostly because of clues that point in several directions, or in no direction. For instance, 5-Across, five letters: “Puts out.” EMITS? OUSTS? No. Two clues I especially liked: 25-Down, four letters: “Element of film noir lighting.” And 34-Down, “Film studied in physics labs.” No spoilers: the answers are in the comments. 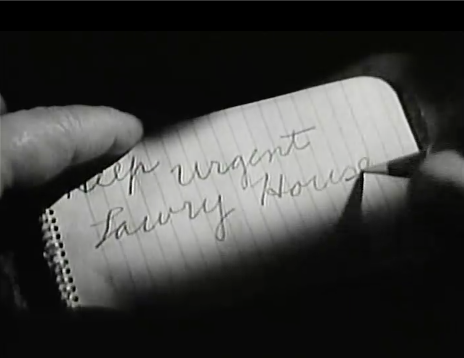 Or if you’re a suspect in a murder investigation, like Hitchcock’s Uncle Charlie, you could turn a single page into a house. That’s Moe Strauss of the Pep Boys on the table. 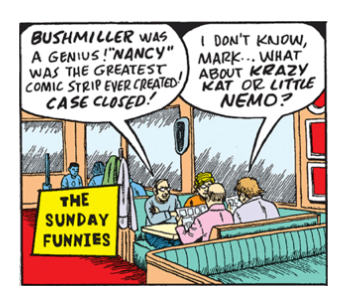 The Boys have appeared in several Zippy strips. You can search and find them all. Louis Armstrong was born on August 4, 1901. Give this son of a gun eight stars! Lombardo! These people are keeping music alive — helping to fight them damn beboppers. You know, you got to have somebody to keep that music sounding good. Music doesn’t mean a thing unless it sounds good. You know, this is the band that inspired me to make “Among My Souvenirs.” They inspired me to make “Sweethearts on Parade.” They’re my inspirators! That’s from a blindfold test published as “Lombardo Grooves Louis!” (Metronome, September 1949). Armstrong was listening to six recordings. He gave two, three, or four stars to Roy Eldridge, Bunk Johnson, Woody Herman, Art Hodes, and Benny Goodman. Guy Lombardo outranked them all. Genius confounds. 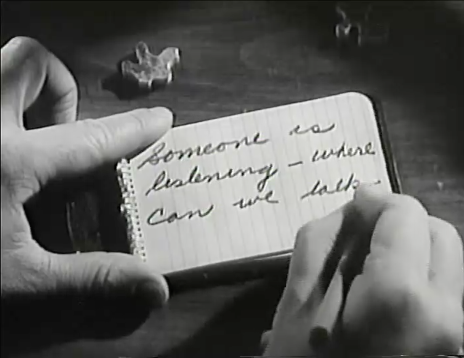 Here is the 1945 Lombardo recording Armstrong was evaluating: “Always” (Irving Berlin). And here is Armstrong’s 1942 recording of “Among My Souvenirs” (Edgar Leslie–Horatio Nicholls). And from 1930, a surreal ”Sweethearts on Parade” (Carmen Lombardo–Charles Newman). Genius confounds. Louis Armstrong’s recordings are now playing at Columbia University’s WKCR-FM. The Fred Rogers documentary Won’t You Be My Neighbor? (dir. Morgan Neville, 2018) is coming to PBS in 2019. Now if only they’d run Mister Rogers’ Neighborhood. Great Britain consists of England, Scotland, and Wales — all three on the island known to the Romans as Britannia. (Modern usage routinely shortens the name to Britain.) It differs from United Kingdom, which also includes Northern Ireland. Some people wrongly think of Great Britain as a boastful name. But it’s not: it’s rooted in history. Great Britain was once contrasted with Little Britain (or simply Brittany), in France, where the Celtic Bretons lived. Although the OED’s last citation for Little Britain dates from 1622, the term Great Britain has persisted (though perhaps not without a sense of pride). Don’t get me started on the Channel Islands, the Crown Dependencies, and the difference between the British Islands and the British Isles. So many parts! It is better to have pizza you don’t want than to want pizza you don’t have. Salzberg’s Theory of Pizza would give someone like Marie Kondo the fits, but I think it makes good sense. Better to have that book on the shelf than not. Better to pack that umbrella than not. You might need it! I think that Salzberg’s Theory of Pizza deserves to be better known. 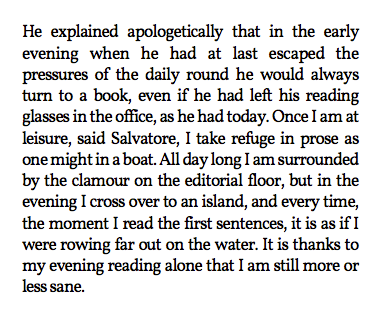 Salvatore Altamura is reading, book close to his face, glasses on his forehead, when the narrator meets him outside a bar.